From Egypt to India, the Czech Republic to Venezuela, Kenya to the British Virgin Islands, China to Canada, and New York to California, people all over the planet will be "finding their way" to GIS during GIS Day's fifth anniversary celebration this November 19. Year after year, the world's GIS enthusiasts accept the challenge to diligently prepare for GIS Day. Volunteering their time, money, and talents to plan and organize presentations and demonstrations, these dedicated GIS professionals work hard to create opportunities for people to experience the vast possibilities and extraordinary power of the technology called GIS. If you are traveling on a city bus in San Diego, California, this November 19, you may just need to scoot over to make room for one of the 18 fourth and fifth grade Junior Girl Scouts experiencing GIS technology for the first time. Junior Girl Scouts from Troop 3116, led by Lisa Stapleton, a GIS professional working with the San Diego Geographic Information Source (SanGIS), will work together on GIS Day 2003 on their quest to earn their Finding Your Way badges. SanGIS is a joint powers agency of the City and County of San Diego responsible for maintenance and public access to regional geographic databases. The Finding Your Way badge, one of many badges in the official Junior Girl Scout Badge handbook, includes 10 suggested activities related to mapping and navigation that can be completed to earn a badge. The main objective and goal of the badge is to teach the scouts how to read a map and/or use a compass to, as the handbook states, "get you where you need to go!" The week before GIS Day the girls will meet to examine online bus schedules on the Internet to plan a bus route from their meeting place to the SanGIS office. They will then use the most efficient itinerary to ride the city bus on GIS Day, tracking their way with a handheld GPS device. While en route, Stapleton will discuss a variety of GPS/GIS related issues including data collection, data sources, and accuracy of data. After the troop arrives at the SanGIS office, volunteer staff will use the ArcGIS application ArcMap to demonstrate the concept of "living maps" to show the scouts how map attributes can and need to be maintained to reflect changes in the community and world. They will finish up their day by working with SanGIS employees to plot maps with orthophotos of each of the girl's neighborhoods to take home with them as a memento of their day. Lancaster County, Pennsylvania's GIS department will celebrate GIS Day 2003 not just for a day, but for an entire week this November. Members of the Lancaster County GIS Division will give presentations at local schools and establish an "adopt a class" program whereby GIS professionals will help teachers with integrating GIS into their curriculum. Training sessions for municipalities and watershed groups will take place midweek with an open house, tour, and map gallery open to the public rounding out the week's festivities. 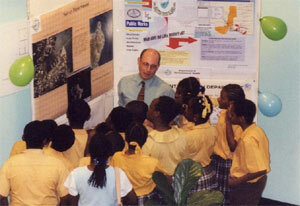 Sharing GIS with some future caretakers of the British Virgin Islands. Last year's GIS Day events in the British Virgin Islands (BVI) were so successful that organizers decided to expand this year's program. Plans began early in August when National GIS Steering Committee members began work developing and preparing a GIS education package that would be distributed to the 21 BVI primary schools. The GIS/geography educational package was made into a special CD atlas that includes an introduction to GIS use in BVI, a large sample map describing the different parts of a map, exercises explaining how to read maps and find locations, and data and information about the various national parks within BVI. The packages were then sent to the primary schools asking teachers to introduce the CDs into their classroom studies and begin preparing their students for a series of geography quizzes (Geo-Quiz) that would be given in October at each school. Regional winners of the local quizzes would then be invited to take part in the final round of the Geo-Quiz on GIS Day at the Joseph Reynold O'Neal Botanic Gardens on the island of Tortola. The goal is to give all students the opportunity to learn about their local geography and how GIS technology is used in their region for decision making and societal improvements. "GIS Day is very important to us in BVI," says Alan Mills, BVI National GIS Steering Committee chairman, "as it is a chance to show the general public and children particularly how important GIS is and how it assists us every day to know more of our local geography." The GIS Day committee offers a variety of materials to assist you in planning your event including PowerPoint presentations, logos, sample agendas, press release templates, banners, certificates of participation, international translations, and many age-specific activities for students in K12 as well as higher education. The materials have been updated for 2003, so once you register your event, feel free to download what you need and take advantage of these wonderful tools. Remember that GIS Day can make a difference in the world and be the impetus for change within your organization. 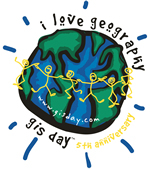 Now that you have read how others are planning to celebrate, it is time for you to visit the GIS Day Web site at www.gisday.com and register your event. Don't forget to submit photos and follow-up articles after your event by visiting gis.esri.com/gisday/successstory.cfm on the Web.